Well, we made it to New Year's Day. Not really much to do today it is cold outside with a blizzard on the way. I would probably kick back and read for a bit, but there is a Twilight Zone marathon and that is one of my guilty pleasures. Been a longtime fan since I was a kid. The episodes really don't scare me anymore, but I am of an age where I can understand Serling's moral messages. That is not what I am writing about today. 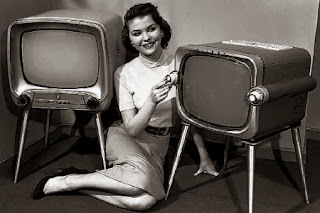 Today I speak about old TV and old movies in general. While I watch these movies I am as much enjoying the setting as well as the story. I enjoy watching what was modern turned time capsule. I'm not talking about attempted recreations of the past. I'm talking about movies set in what was the modern day. I love watching the old signs, the house furnishings and appliances, the sayings, pool halls, diners, the events and norms of the day. What some people see as dated and devoid of what they see as familiar I see as a treasure of history. Not the famous history of Earth shattering events, but simple cultural history. These films are accurate representations and I predict will become more and more important in educational study of culture. It is armchair archeology. Pretty soon we'll have one hundred year old TV shows. While yes, I confess do enjoy the pop ephemera. I really do watching the old fashioned world of The Three Stooges or Laurel and Hardy. So many of their productions were set in old hotels, houses or just outside in the city. You see everything they took for granted and totally forgot about. While much of what I am talking about is looking into an era that predates me or my memory. The rest of it is revisiting youth. Both versions are just as enjoyable. So if you enjoy history and you seek it in books, documentaries, courses here is one more angle to try. Just sit back and watch old TV with another level of enjoyment. You'll be surprised at what you find. Time is a tough thing to capture. Even a film shot in 2000 is a time capsule already. Orson Welles made movies about time lost. It's hard to find language to describe it in a sentence, but in a fine film or an old TV show it's all there. I guess that's what makes finding these time capsules so enjoyable. They are glimpses and due to the chaotic nature of the Universe it is really hard to preserve the videos. I'm sure that the Hollywood stuff is somewhat fine, but the local TV, even home videos and the like will be more difficult.